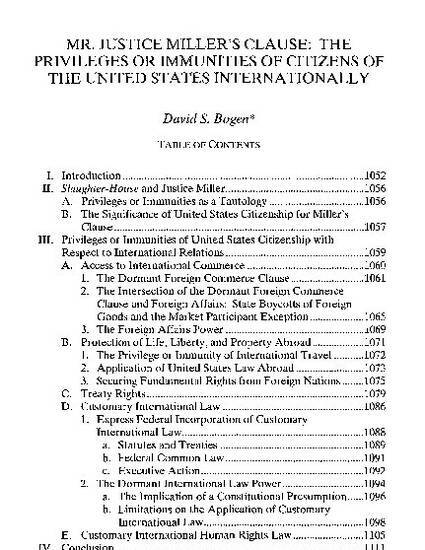 Justice Miller’s list in the Slaughter-House Cases of privileges or immunities of citizens of the United States includes a significant number of international ones. This article examines the international dimensions of the Fourteenth Amendment’s privileges or immunities clause. These include the ability to engage in international trade and commerce; the protection of person and property abroad; the rights secured to individual citizens by treaties of the United States; and the privileges and immunities available under customary international law to the extent that the federal government behaves consistently with such rights. In addition to describing the privileges or immunities, the article urges development of their substance in the future that focuses on the nature of the privilege. From an international perspective, the federal government is instituted to protect its citizens internationally. This suggests a number of principles in application for the future; for example, states cannot extend boycotts to citizens dealing with disfavored foreign governments unless Congress approves, international travel is limited only by deference to executive and legislative discretion in foreign relations, treaty provisions establishing individual rights should usually be self-executing, and states may not establish a foreign policy in breach of customary international law in the absence of federal indications of support for the state’s policy. 56 Drake Law Review 1051 (2008).